One of the foremost European artists of the post-war period, Crozier (1930-2011) was artistically and philosophically influenced by the Existentialist movement in Paris. He brought such outlook to bear on images of a traumatized humanity in the aftermath of the two world wars. 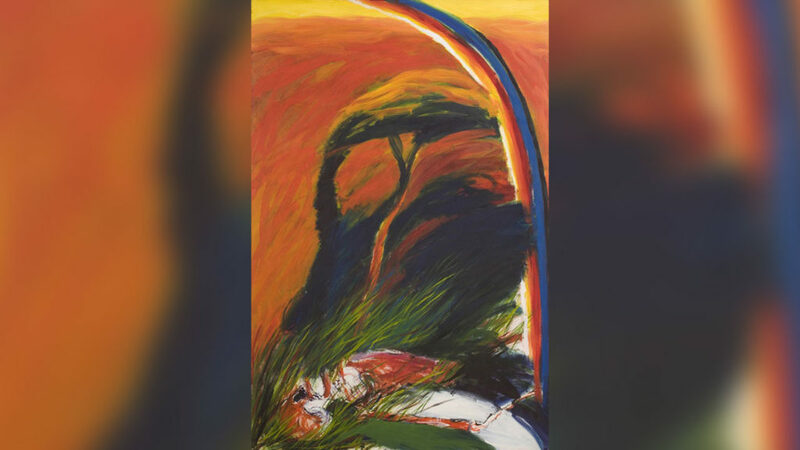 Ireland’s Great Hunger Museum at Quinnipiac University has acquired the painting, “Rainbow’s End,” by the Scottish-Irish artist William Crozier. In this celebrated series, Crozier communicates universal themes of moral evil, trauma and alienation. His links with Ireland, especially West Cork, the scene of some of the most horrendous examples of starvation and famine-related suffering and death, makes this painting particularly apt for the collection. “Rainbow’s End” shows a decomposing human cadaver, in a wind-blasted landscape, painted in intense, hot color, a 20th-century memento mori. Crozier’s passionate involvement in Ireland and Irish history suggests that the alienated body represents inhumanity across the ages, and resonates with the paradoxes of the Great Hunger that occurred in a country that produced abundant food while its people died. This one skeleton represents all victims of the Great Hunger, so many of whom remained unwaked and unburied. William Crozier was born in Glasgow in 1930 and grew up in Ayrshire in a parental home that was as much Irish as it was Scottish, a dual cultural inheritance that is fundamental to an understanding of the artist. Crozier studied painting and drawing at Glasgow School of Art from 1949-53. Throughout a long life of painting that evolved from the dark early Essex landscapes to the radiantly colorful images of West Cork, the philosophical foundation of his art in the service of humanity remained constant. Crozier thought of Ireland as his spiritual home. In the mid-1950s, he lived in Dublin, where he formed close friendships in Dublin’s literary circles, notably with Patrick Kavanagh and Anthony Cronin. Although it was in the larger professional circle of London’s art world that he established his impressive reputation, his move to West Cork provided the context for his mature work. Ireland’s Great Hunger Museum at Quinnipiac preserves, builds and presents its art collection in order to stimulate reflection, inspire imagination and advance awareness of Ireland’s Great Hunger and its long aftermath on both sides of the Atlantic. Works by noted contemporary Irish artists are featured at the museum including internationally known sculptors John Behan, Rowan Gillespie and Éamonn O’Doherty; as well as contemporary visual artists, Robert Ballagh, Alanna O’Kelly, Brian Maguire and Hughie O’Donoghue. Featured paintings include several important 19th and 20th‐century works by artists such as James Brenan, Daniel Macdonald, James Arthur O’Connor and Jack B. Yeats. Ireland’s Great Hunger Museum, 3011 Whitney Ave., is home to the world’s largest collection of visual art, artifacts and printed materials relating to the Irish Famine. The museum, located at 3011 Whitney Avenue, is open Wednesdays 10 a.m. to 5 p.m., Thursdays 10 a.m. to 7 p.m., Fridays and Saturdays 10 a.m. to 5 p.m., and Sundays 1-5 p.m. Admission is free. For more information please call 203-582-6500 or visit www.ighm.org.